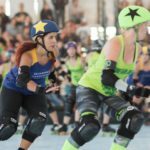 Bad Astral has been reporting on roller derby in Northern California and beyond since 2009. 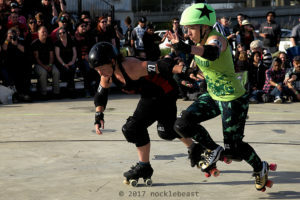 The Bay Area Derby season opener pitted the San Francisco ShEvil Dead against the Oakland Outlaws in an early evening bout. It was a warm and sunny day in Oakland at BAD’s new venue, The Station. 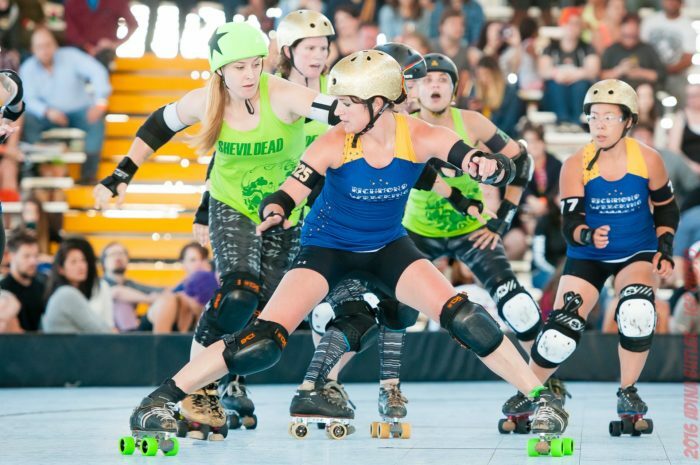 The track was drawn with concrete and tape, just like in the derby days of yore, and the skaters wore sunglasses in addition to their protective gear. 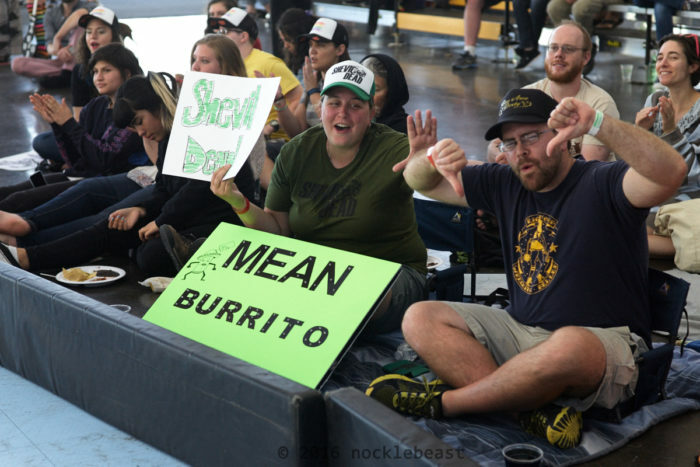 The bout started 10 minutes late so the sold-out crowd had time to be admitted. 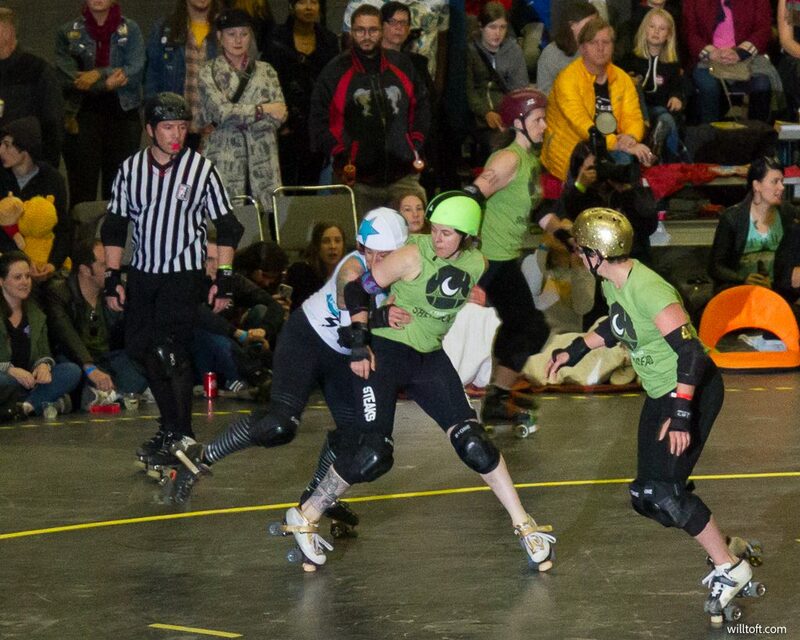 First to the jammer line for ShEvil was #68 Danymite against #333 Dreadzilla for the Outlaws. The first jam was a cut and dry quick pass and score, 4-0, ShEvil. With 26 minutes remaining in the first half, #31 Frightmare for ShEvil, was first through the pack with a no pass, no penalty and was not awarded lead. This gave opportunity for #99 Pizza Party of Oakland to get lead and immediately call off the jam at 0-0. Throughout the next six jams, ShEvil and their triangle defense got lead jam every single time and held Oakland scoreless until about 22 minutes left in the first half. Finally, #313 Smother Mary of the Outlaws snuck in a quick 4 points before Frightmare called off the jam: 24-4, ShEvil Dead. 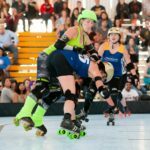 With a new ruleset in place, the first few bouts of the season are always a little tricky for the referees and skaters alike. Numerous “legal” cuts occurred, with a delay in penalty and/or a delay in player yield. At one point, #246 Sinnabar cut the track, waited to make eye contact with the ref, then took a step off the track and went to the back of the pack to try her pass again. The latest ruleset says a cut penalty may be avoided if advantage is immediately yielded. In the next jam, Dreadzilla of the Outlaws made a high and tight toe stop pass on the outside line to get lead. ShEvil jammer, #212 Xpress Lane Jane, removed her helmet cover and passed it to the pivot, who was immediately assessed a low block penalty. Score 25-12, ShEvil. 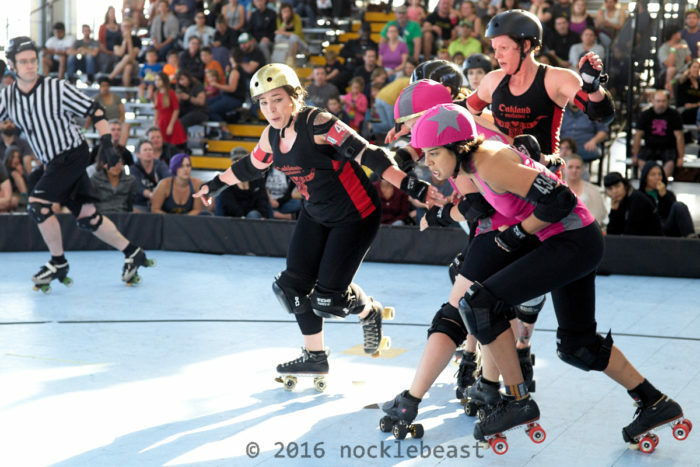 The second half of the first quarter began with a new heat as the skaters adjusted to the concrete and sunshine. Oakland’s Pizza Party got out of the pack first but was immediately sent to the penalty box. This gave Frightmare the opportunity to pass the star to #89 Mean Burrito, adding two grand slams (10 points) to ShEvil’s total score. Meanwhile, #410 Ames to Maim of Oakland was assessed a direction of game play penalty, and sunglasses were seen flying to the inside and the outside of the track. Score 46-19, ShEvil. With 10 minutes left in the first half, the announcement came over the loudspeaker that the bout had officially sold out. 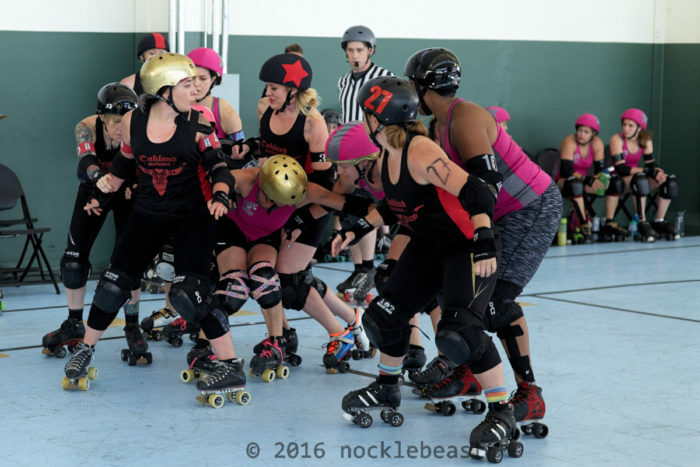 By now the teams were trading off lead jammer every other jam, with Danymite of ShEvil and Pizza Party of Oakland having the most success. Score at the half: 89-51, ShEvil Dead. 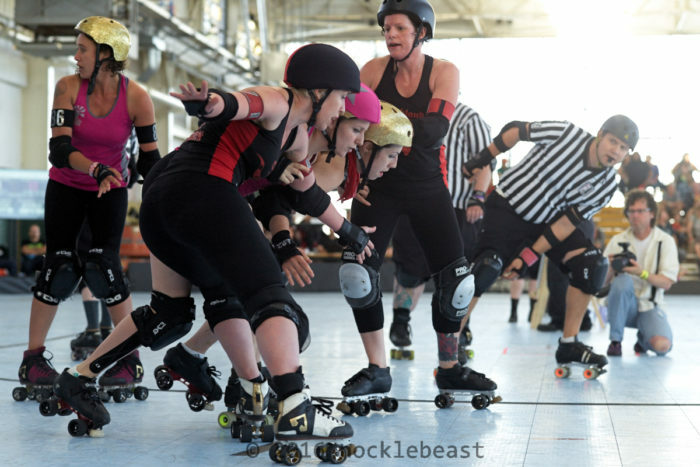 The ShEvil Dead returned to the track for the second half in force and continued to dominate the lead jammer ratio. 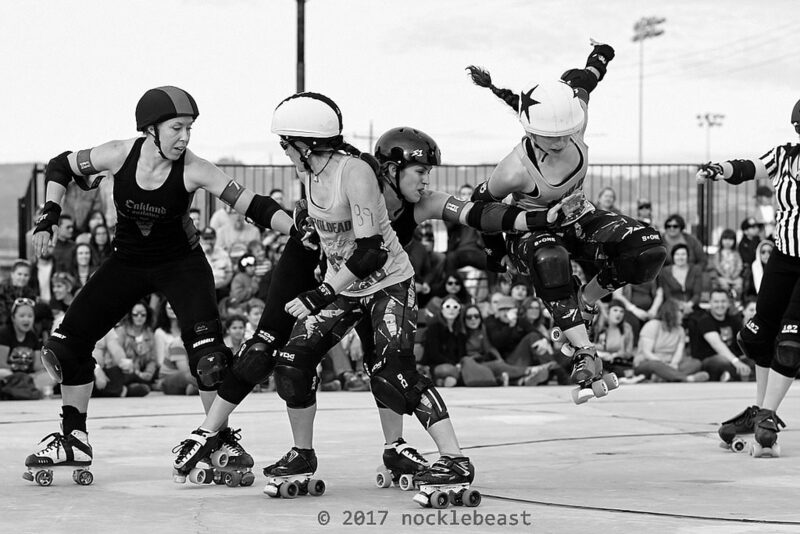 On a particularly impressive pass, Frightmare turned backwards and passed on the inside of the apex for lead jammer and a grand slam aided by fierce ShEvil blocking from Mean Burrito and #404 Permab&. 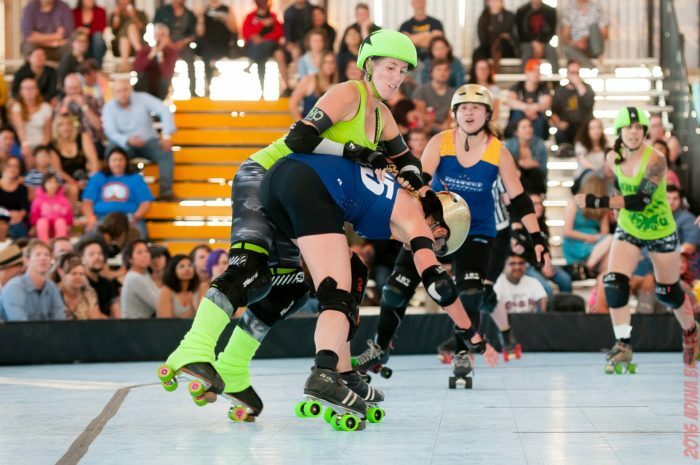 With 24 minutes remaining in the game, Oakland’s jammer Dreadzilla earned lead jammer but committed a back block penalty on her scoring pass, leaving Frightmare to contend with Oakland’s brutal blockers for a full two minute jam. 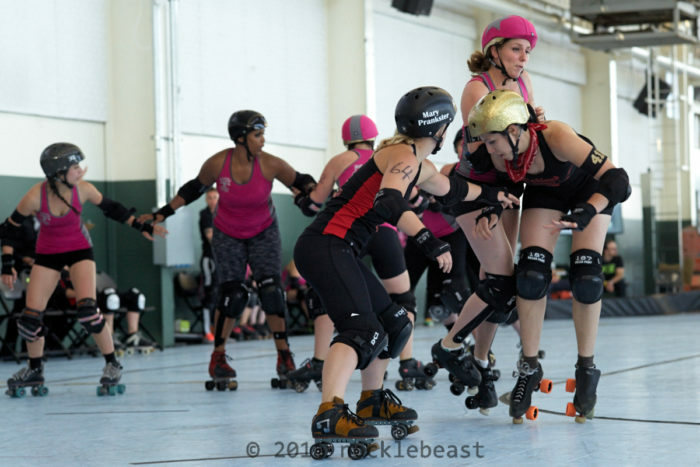 After scoring 15 points of her own and with Dreadzilla back on the track, Frightmare played a bit of defense to knock out and drew a cut track penalty on the Oakland jammer. ShEvil kept hold of the lead: 111-64. With 5 minutes remaining ShEvil jammer Danymite (recent addition to the BAD travel team) made an uncontested pass on the outside for lead, and slid through a second time, like butter, for one, then two grand slams. On her third scoring pass, Murderyn Monroe delivered a devastating chest hit, which stunned Danymite long enough to let Sinnabar sneak in two points. Score 179-114, ShEvil. With only minutes remaining, the skaters on the track were visibly fatigued but in no way disheartened. First, Pizza Party did a face plant, then Frightmare. Pizza Party recovered to get lead jammer only for Sweet Sherry Pie to take the ShEvil star pass from and chase her down for a scoreless jam. Danymite once again snatched lead jammer for the final jam, playing it conservatively, she added a few more points to ShEvil’s score then called the jam off to end the game. Time will tell if these two teams play each other again this season. Oakland Outlaws next face the Berkeley Resistance on 5/13, while San Francisco ShEvil Dead takes on the Richmond Wrecking Belles on 6/3. Both games will be held at The Station and are part of our discounted BAD Deal which includes the doubleheader Championship at the Craneway Pavilion on 8/19. Saturday night saw a rematch between the two teams who played for third at the end of 2015. Last October, the Richmond Wrecking Belles won the battle for third despite the San Francisco ShEvil Dead coming in with a victory in their previous meeting in August. Fans of both teams knew this game could go either way. 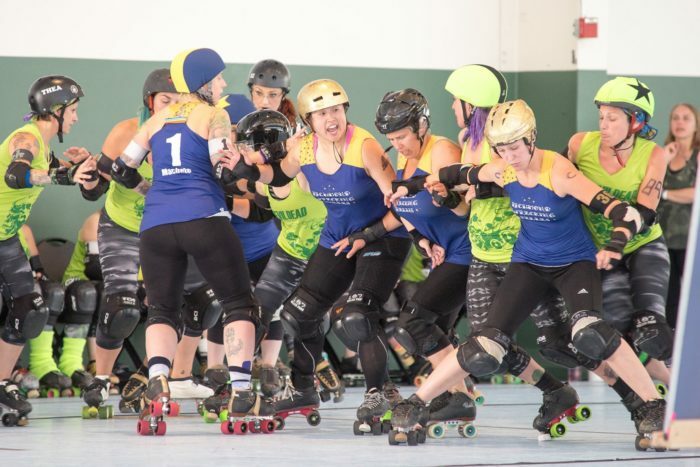 Though Richmond won in their last match-up, the Belles were coming into the game with a very short roster of 11 skaters with ShEvil determined to reclaim a victory. As expected, the game started with an intense and contentious shift. Richmond jammer #20 Eva Menace nabbed lead in the first jam but was sent to the box during her scoring pass which allowed ShEvil’s jammer, #212 Xpress Lane Jane, to pick up some points as well. At the end of the first two minutes, the score was 14 – 10 in Richmond’s favor. In the next jam, #22 Jirsa attempted to drive up the score for Richmond and was awarded 15 points. 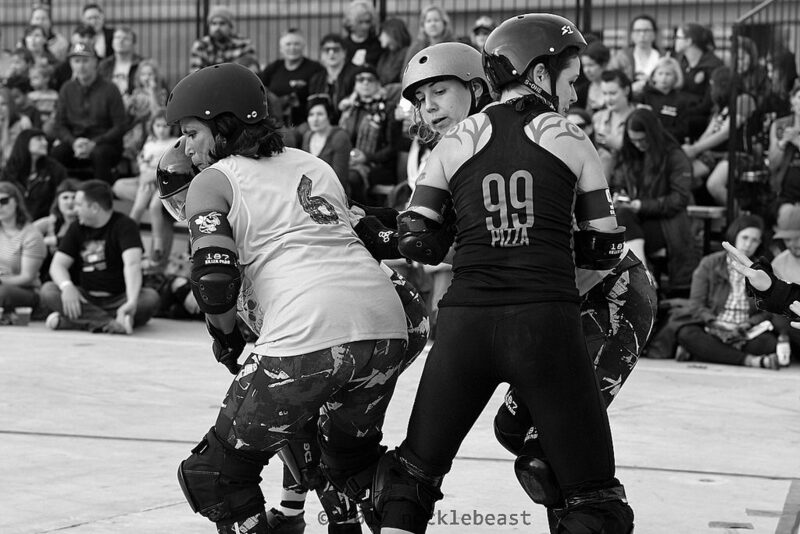 Meanwhile, ShEvil pivot, #29 Spiller, received a star pass from #89 Mean Burrito and was able to pick up 9 points of her own, putting the score at 29 – 19 Richmond. After an exciting and close start, Richmond took control in the third jam and didn’t look back. 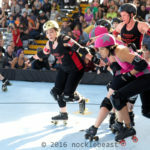 Over the next twelve jams, Richmond was awarded lead jammer status ten times which allowed them to steadily put up points and keep ShEvil to just 7 points by strategically calling off jams. 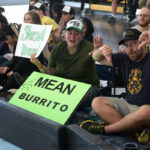 In the fourteenth jam, Jirsa put her team solidly in the lead by scoring 19 unanswered points in a power jam against Mean Burrito, putting the score at 81 – 27. 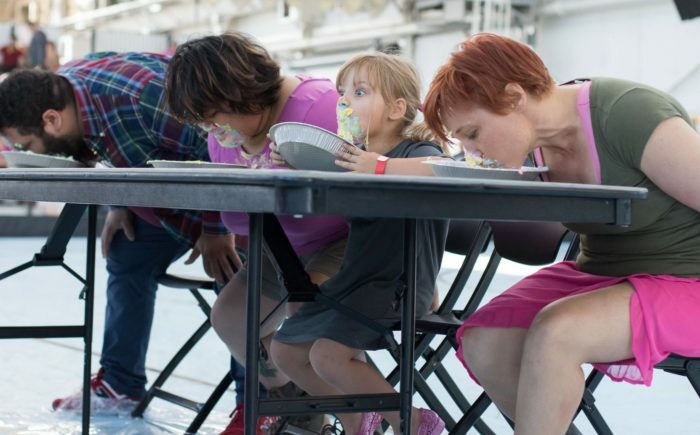 But the Zombies would not be thwarted so easily. ShEvil retaliated by tightening their defense and received an offensive boost of their own when #61 Pressure Cooker scored 13 points in one jam. At halftime, the score stood at 108 – 60 with Richmond in the lead. The second half started just like the first with both teams scoring at a similar pace. In the first five jams, Richmond managed to score 10 points while ShEvil picked up 9, which did little to change the score differential. Although Pressure Cooker had another 13 point jam, Richmond jammers #11 Lex Pistol and #925 Sterling Archer both had a couple of multiple scoring pass jams, padding their lead at 172 – 98. A little more than halfway through the second period, Richmond ran into some penalty trouble when Sterling Archer received three penalties as a jammer, which spanned a period of two jams and resulted in her fouling out of the game. Here, ShEvil pulled out all the stops and made a valiant effort to close the point spread. 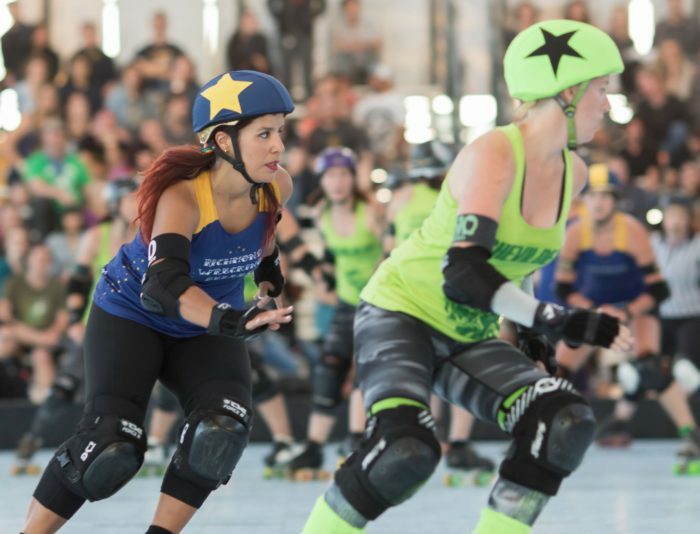 However, Richmond’s formidable defense forced a jammer cut on Pressure Cooker, and after returning to the track, she passed the star to pivot Sweet Sherry Pie who picked up four points. The next jam began with a power start for Gori Spelling, who took the opportunity to rack up a grand slam. As time ran down on the game clock, Richmond claimed the win with a score of 181 – 115. 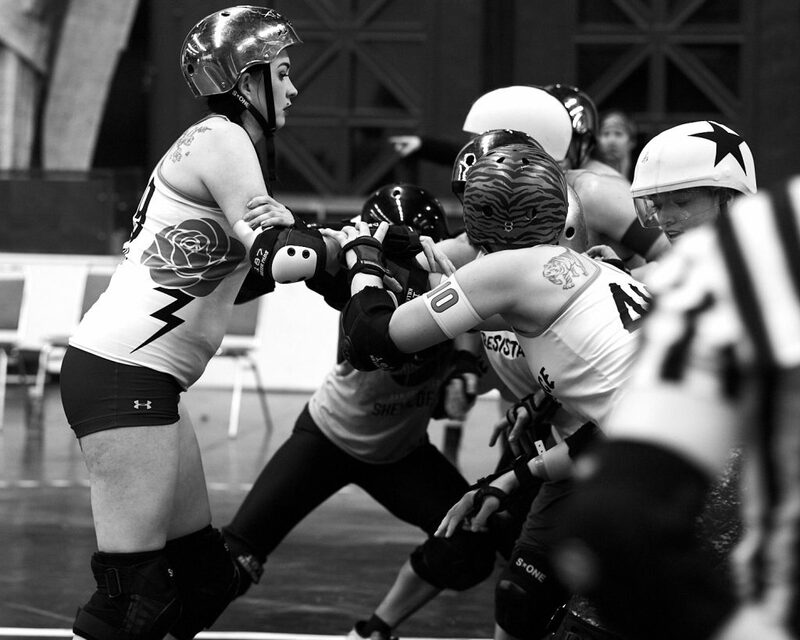 The highest scoring jammer by far for ShEvil was All-Stars team member Pressure Cooker. With 60 points, she scored more than half the total points for her team. Xpress Lane Jane was the second highest ShEvil scorer with 23 points in thirteen jams. Richmond employed an interesting tactic for this game by rostering two hybrid players who split jamming duties between the halves. For the first half, blocker Jirsa wore the star and in the second half she switched places with Sterling Archer. Jirsa scored 48 points in seven jams, making her the highest point scorer for Richmond. 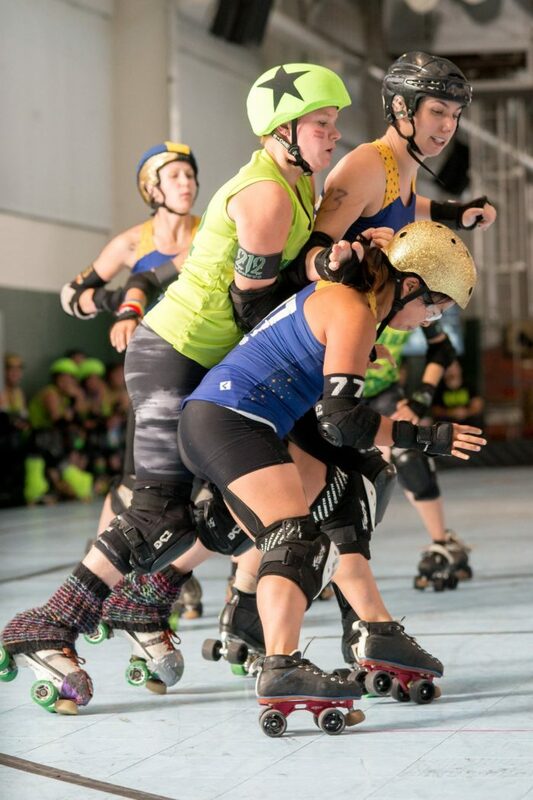 Eva Menace was the second highest scoring jammer with 46 points in 13 jams. Richmond’s win was decided by their overwhelming lead jammer percentage. ShEvil combated this by frequently passing the star, which they did seven times compared to Richmond’s two times. ShEvil struggled initially with penalties. In the first half, they were boxed 21 times but they cleaned up considerably in the second half of the game with just 14 penalties. Richmond’s penalties were consistent throughout the game with 13 in the first half and 15 in the second. With both teams having the same number of jammer penalties, the game really came down to the ability to rack up points slowly with consistent lead jammer calls and smart, timely call-offs. Both teams are slated to play in the next double header on July 23, just weeks after this battle. ShEvil will take on the reigning 2015 BAD Champions, the Berkeley Resistance, and Richmond will play their longtime rivals, the Oakland Outlaws. 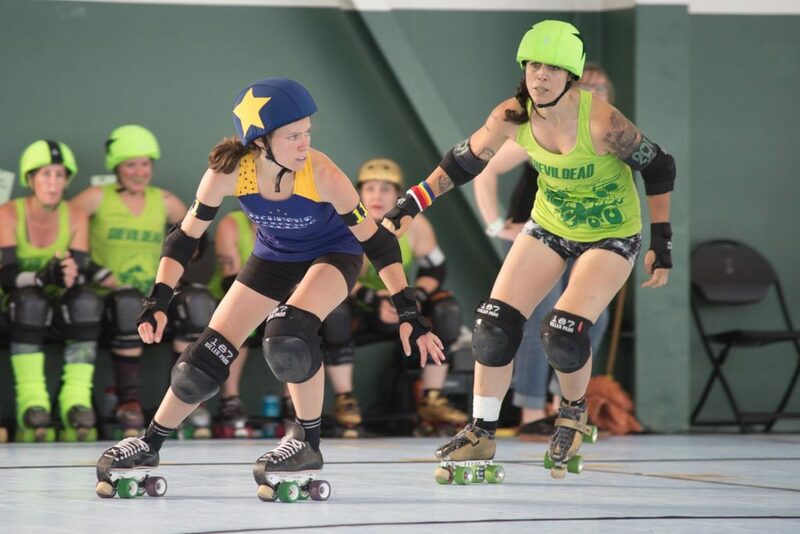 In a rematch of the 2015 BAD League Championship game, the Oakland Outlaws faced a depleted Berkeley Resistance squad and came away with a resounding win thanks to their veteran blockers and an overworked Berkeley jammer rotation. At the first whistle, Oakland opened the scoring with #33 Vee putting up 14 on her way to being the game’s high scorer with an impressive 82 points. Berkeley got on the scoreboard soon after but then their offense went cold for eleven jams allowing Oakland to go on a 32-0 run. The Resistance responded with two strong jams from #888 Brawllen Angel and #1217 Chasing Amy, but were unable to gain ground on the Outlaws. Berkeley would settle at 63 points to Oakland’s 106 at the half. The real story for Berkeley was their diet roster of only 11 skaters who labored valiantly to match the Outlaws horde. 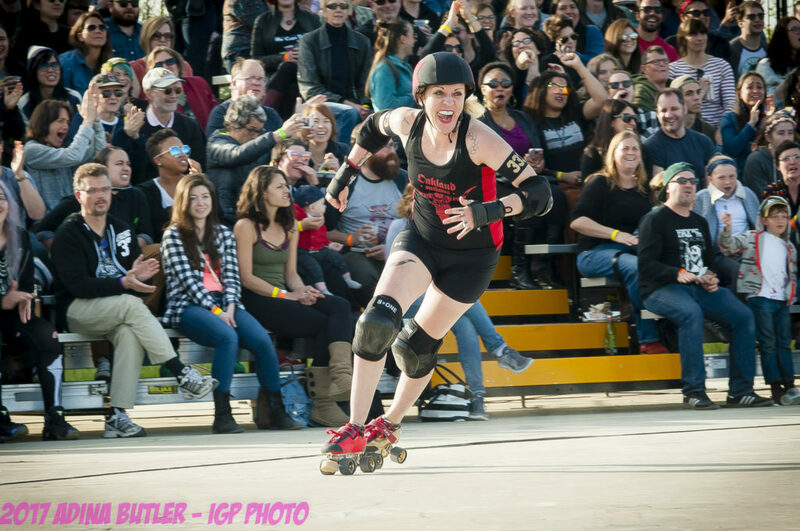 #86 Gretchen Vomette skated in ten of the first eleven jams as well as the Resistance captain, #405 Dirty Lil Trick, skating in nine consecutive jams at one point. 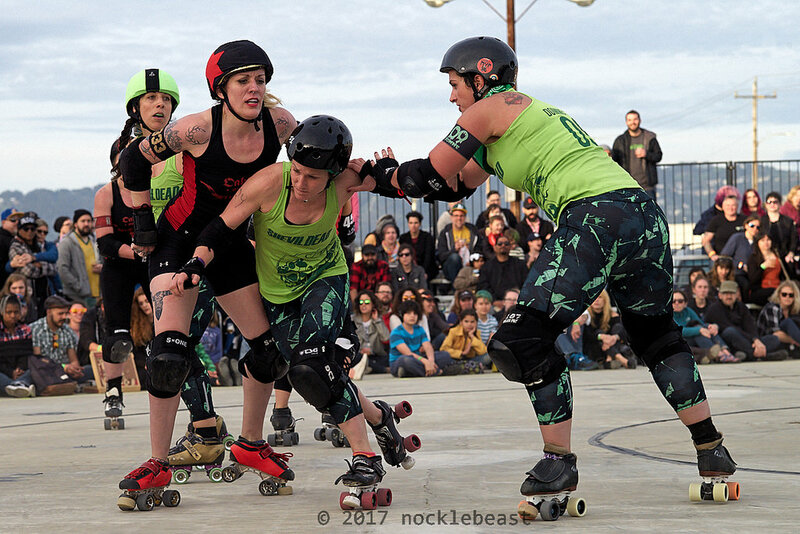 Berkeley’s offense struggled to stay even with Oakland in the second half with reserve jammer #434 Shenghis Khan getting caught up in a whirlwind of penalties over three jams leaving Oakland jammers #10 Huck Sinn and #333 DreadZilla able to capitalize. Stifling defensive blocking from Outlaws veteran #7 Murderyn Monroe and relative newcomers #410 Aims to Maim and #29 Dual Hitizen put Oakland in the driver seat after halftime. 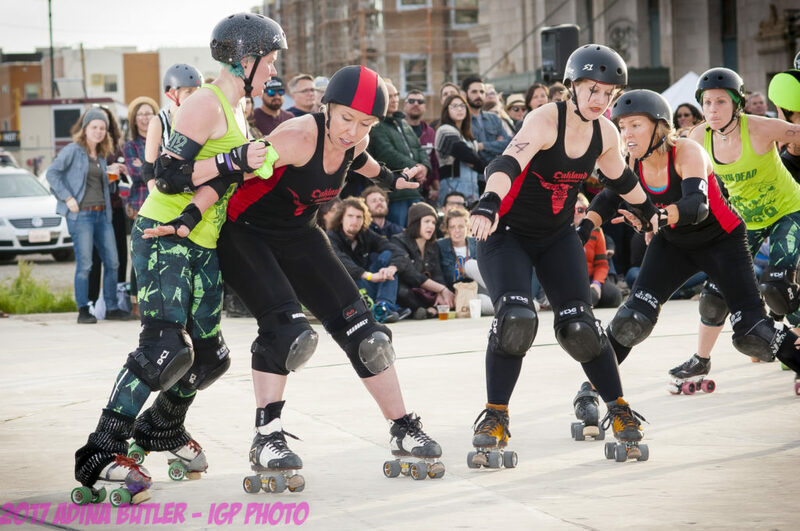 The most recent addition to the Outlaws jammer line up, #99 Pizza, was able to break off an 18 point jam – her share of 99 total second half points for the Outlaws. 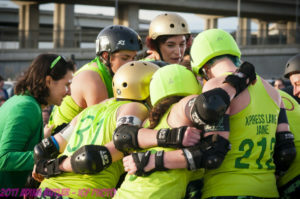 Ultimately, Oakland outlasted Berkeley, taking control of the game by grabbing Lead Jammer status 25 times out of 43 total jams and taking advantage of a Resistance corps that barely had time to catch their breath in the second half. The final score was Oakland Outlaws 205 to Berkeley Resistance 168. With their win the Outlaws go to 2-0 for the season. Berkeley adds a loss to their one win and now stand 1-1. Both of these teams have different opponents on July 23. 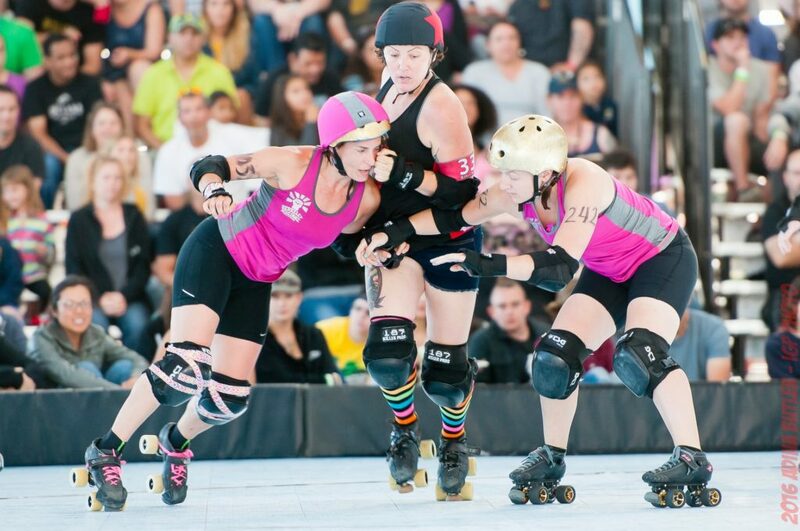 For the first bout, Berkeley will face off against the upstart zombies of the San Francisco ShEvil Dead. 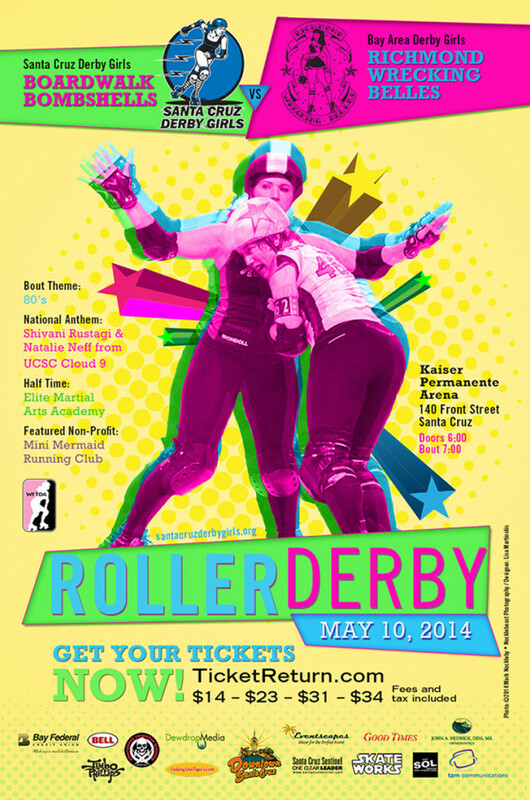 In the second bout of the evening, Oakland will go up against their longtime rivals the Richmond Wrecking Belles.